From now on the list of my publications is rendered using Jekyll-RDF. I’ve used the bibtex2rdf script together with a customized mapping to convert my bibtex file to RDF. This file is consumed by JekyllRDF and rendered together with the rest of my blog using the publications template for the lost of all publications and an additional template to render a page for each individual publication resource. Today I’ve released my #jekyllrdf Tutorial Screencast on Vimeo. 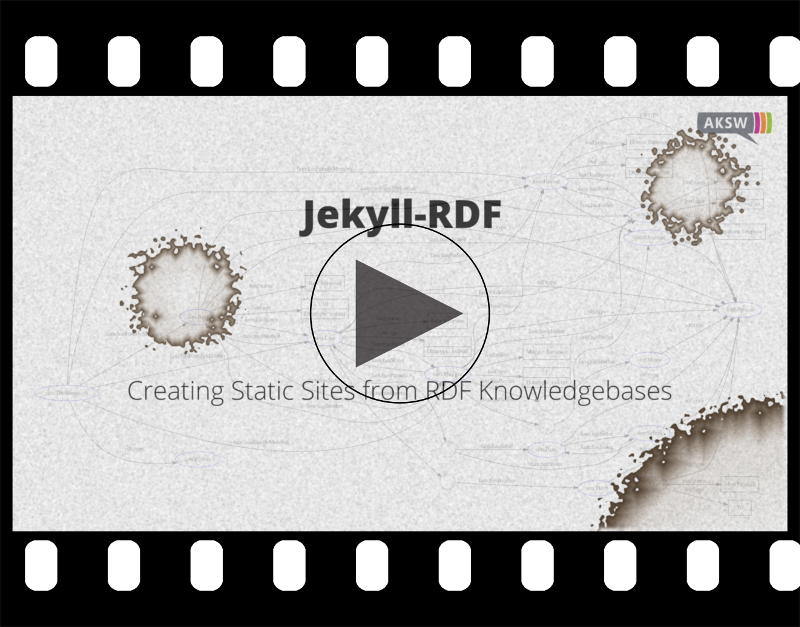 It teaches you all the basics necessary to create a simple Jekyll page from an RDF knowledgebase. I hope that you enjoy it and that it is helpful for you! Bitcoin.de as some other pages is using a One-Time-Pad (OTP) as two-factor authentication method, actually it is a Time-based One-Time Password algorithm (TOTP). The Passwords are generated based on a shared secret as specified in RFC6238. When activating the two-factor authentication on bitcoin.de the page shows a QR code which is used by OTP apps, such as andOTP (github), Google Authenticator, or OTP Authenticator (github), to transfer the shared secret to the phone. Additionally the page shows the shared secret as a string of letters and numbers, which one should write down and deposit in a safe place. qrencode -o code.png -t png "otpauth://totp/<name>?secret=<secret>"
Now just open code.png with an image viewer on your PC and scan the code with your phone. Ein neues Rezept ist online: Kartoffelsalat mit Räuchertofu. Richard Stallman is speaking at the GI INFORMATIK 2017. In his talk he is using “Person” and the pronouns “per”, and “per’s” which work like “her” and “her’s” but for any gender. 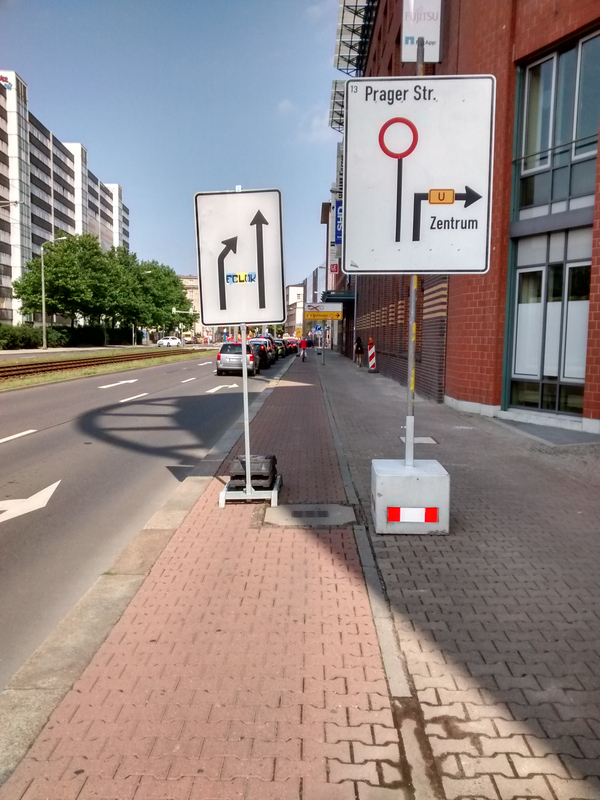 This post was purely created with free software (vim, git, jekyll) and is licensed under CC BY-ND.
.@Poliauwei was macht man denn mit falsch geparkten Schildern auf dem #Fahrradweg auf der Prager Straße in @StadtLeipzig? 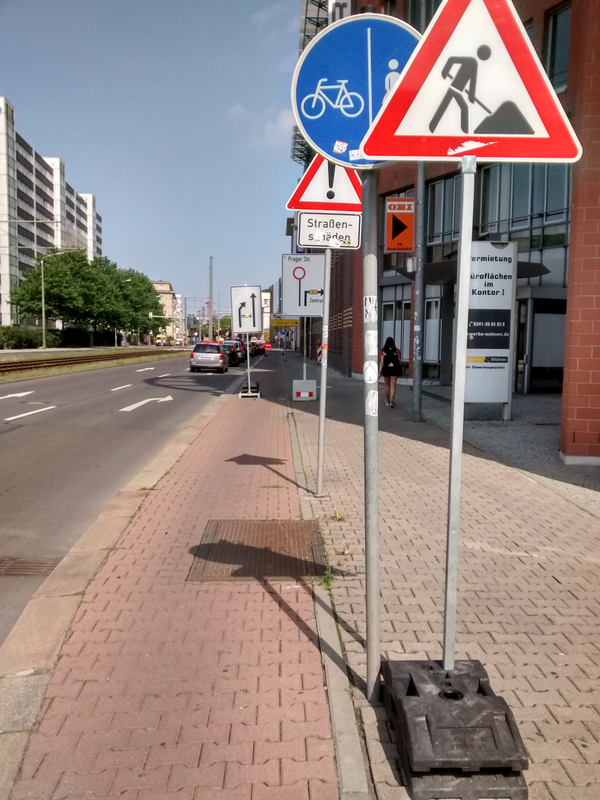 Gerade auf meinem Weg durch das Netz bin ich bei StackOverflow vorbeigeschlendert. Eigentlich war ich dienstlich unterwegs, dabei wurde ich durch einen schwarzen Balken ganz oben auf der Seite abgelenkt. Es geht um Netzneutralität, was einfach gesagt die Gleichberechtigung aller Datenpakete im Internet bezeichnet. In erster Linie ist das eine technische Angelegenheit aber dennoch hat diese Angelegenheit viel mit unserer heutigen Realität zu tun. Ein Großteil unserer Kommunikation einschließlich des Medienkonsums läuft heutzutage über das Internet. Die Netzneutralität repräsentiert also heute in großen Stücken die Redefreiheit! Das Thema ist akut, da die Zulassungsbehörde für Kommunikationsgeräte in den USA Federal Communications Commission (FCC) eine Änderung ihrer Regeln mit dem ironischen Title „Restoring Internet Freedom.“ herbeiführen möchte. Durch diese Regeln würde die Netzneutralität in den USA abgeschafft werden. Klar das sind nur die USA, ein Saat mit etwa 3/5 der Einwohner im Vergleich zur Europäischen Union, aber dennoch haben die Entwicklungen im Bezug auf das Internet auf der anderen Seite des Teiches meist auch Einfluss auf unser Leben. euch mit dem Thema befassen und euch angucken was in Deutschland und der Europäischen Union der Stand der Debatte ist. (Bei den letzten beiden Optionen weiß ich nicht, ob das nur für US-Bürger gedacht ist). For my work on the dockerjekyllpages image (docker hub, GitHub) I came across the issue that I also want to be able to build from private git repositories and thus want to authenticate using a private SSH key. During my research on this topic I came across this stackoverflow post by Aistis which proposes forwarding the SSH authentication socket (or authorization, not sure about that) which allows the container to communicate with your hosts SSH authentication method. I think this is a very clean solution and thus I’ve implemented it as follows. Per default the SSH_AUTH_SOCK environment variable is set to /var/run/ssh-agent.sock in the image. Thus for running the container you only have to mount the hosts SSH_AUTH_SOCK to the container by adding the argument -v "$SSH_AUTH_SOCK:/var/run/ssh-agent.sock". Until this point I didn’t realize, that it is possible to mount individual files into a docker container rather then only complete directories. This stackoverflow post opened my eyes. If you don’t have an SSH_AUTH_SOCK running on the docker host you can still mount an id_rsa-file e.g. with -v $HOME/.ssh/id_rsa:/root/.ssh/id_rsa:ro. (The additional :ro prevents the container from changing resp. accidentally overwriting your SSH key.) In the case that you are mounting a private key rather then using the hosts SSH agent it is a good idea to generate a key without password, else the ssh process might prompt you for the password. After solving the authentication with your SSH key the next problem is, that the container usually doesn’t know any remote hosts in its short life time. Thus it will probably prompt for verification of the connection. To prevent the necessity for interaction with the container you can mount the hosts known_hosts-file into the container. You can do this by mounting the hosts known_hosts-file e.g. with -v $HOME/.ssh/known_hosts:/root/.ssh/known_hosts:ro. This topic is also discussed in this superuser question but the first answer is not a solution. Maybe switching to not using root will be a solution. What is the best way to load private SSH keys into a #docker container for cloning e.g. private #git repositories? Since I’ve forked the dockerjekyllpages from DonMcNamara/dockerfiles just over a year ago to run my blog I’ve done some changes – improvements in my eyes. To make them usable for others I frequently built the image on the docker hub and now even tagged release 0.2.0 on GitHub as well as on the docker hub. My planes for the future can be seen in the issue tracker. Feel free to use the container and and send me pull requests or just write issues. From now on I can publish simple status messages as you know it from #twitter #pumpio or #gnusocial. Just not linked so far. Bei meiner heutigen Presseschau bin ich auf die beiden golem und heise/ix Artikel zu einem neuen Sicherheitstest von Mozilla für Webseites gestoßen. Den Test erläutert die Entwicklerin April King ebenfalls in einem Eintrag in ihrem eigenen Blog. Über die Seite https://observatory.mozilla.org/ kann man mit wenig Aufwand die eigene Seite überprüfen. Das ganze habe ich zuerst nicht für relevant erachtet, denn welcher Art sollen schon die Sicherheitslücken in einer statischen Jekyll seite sein, immerhin biete ich ja HTTPS über Let’s Encrypt an (siehe „My New Webpage“). Ich habe aber dennoch einen test gewagt mit einem ernüchternden Ergebnis von D+ :-( So gravierend hätte ich das nicht erwartet, es zeigt mir aber, dass es sich durchaus lohnt etwas an der Stelle zu unternehmen und dass auch simple statische Jekyll Seiten noch verbessert werden können. Da muss ich mich jetzt entsprechend zu den Techniken belesen und sehen, wie sie in Jekyll umsetzbar sind. Immerhin setzt meine Seite keine Cookies und HTTPS passt im Standardtest auch. Heute habe ich mal wieder ein biometrisches Passbild gebraucht. Dabei sind die Farben allerdings nicht besonders gut gelungen und ich finde eh Schwarz/Weiß-Bilder auf Pässen hübscher. Auf Grund dessen habe ich kurz nach Anleitungen zur Konvertierung von Farbbildern in Schwarz/Weiß-Bilder mit GIMP gesucht. Die simpelste Möglichkeit ist über das Menü „Bild“ > „Modus“ > „Graustufen“ das Bild in Graustufen umzuwandeln, das Ergebnis sieht aber nicht immer zufriedenstellend aus. Darüber hinaus gibt es verschiedene Möglichkeiten den Eindruck der Kontraste in Schwarz Weiß zu verstärken. Einen einfachen Überblick über die Möglichkeiten bietet das Tutorial „Converting Color Images to B&W“ und hat mir schnell zur Referenz geholfen. Das Tutorial „Digital B&W Conversion“ erklärt die einzelnen Effekte die bei der Konvertierung auftreten noch etwas genauer und ermöglichen ein tieferes Verständnis. Eine weitere interessante Sache ist die „B/W Film Simulation“ GIMP Script-Fu Erweiterung von Serge Mankovski. 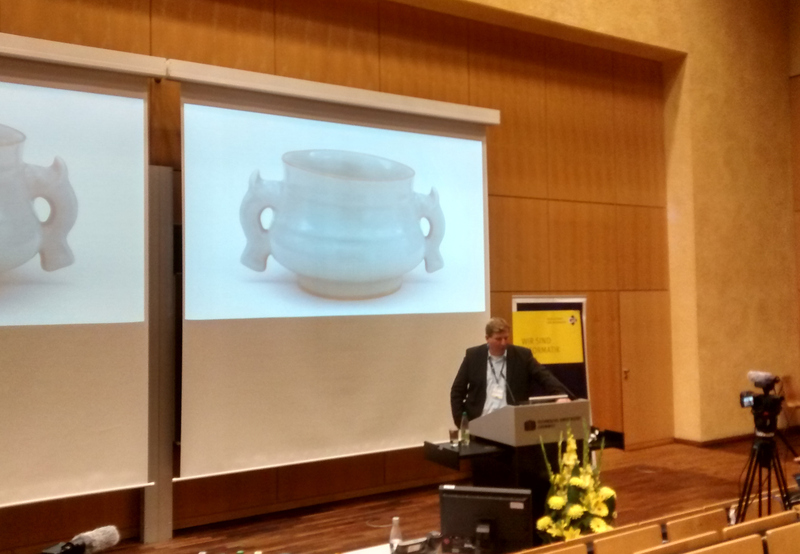 Ein Danke gilt an der Stelle Pierre Vlček, welche in seinem Blogbeitrag „Digitale Schwarzweißfotografie mit GIMP“ die Erweiterung wieder ausgegraben hat. Eine Anleitung zu Installation von GIMP Script-Fu Erweiterungen gibt es in der GIMP Dokumentation. Welcome to my new web page and blog. This time I’ve built the page using jekyll and using a custom theme, based on bootstrap, by taking some inspirations and HTML/CSS snippets from bootstrap’s blog and carousel examples. For the typography I’m using Open Sans and Lato and Font Awesome for the icons. The Publications section was implemented using Exhibit and taking my publications from bibsonomy. The web page has four sections, this one is the “Blog”, where I’m publishing several things which pop into my head. The “Notes” section should be some kind of an open idea management system resp. personal Wiki. In the section “Project” I present some project, which I’m working on and finally my “Publications”. The source code for my homepage is published on github. On the server side I’m making use of docker, especially a setup of jwilder’s reverse proxy and the dockerjekyllpages image by Don McNamara to rebuild the blog, triggered by pushes to my git repository. In addition to the jwilder container, I’m using the Let’s Encrypt companion by Yves Blusseau, to make the site available via HTTPS. My webpage is bi-lingual, which means in this case, that I’m sometimes writing text in German and sometimes in English. I’m if you have problems understanding a text but think, it might be interesting, don’t hesitate to ask me for a translation (but I can’t guarantee anything). Currently this page has not too much content, but I’m planning to gradually integrate some interesting posts form my old blog and also build a live integration of my twitter stream.